Conrad Gargett has revealed details of the commercial complex at the centre of Townsville’s $450 million Hive development. The multi-disciplinary design practice is working closely with DMA Partners, appointed by the Gleeson Group to manage the project. Conrad Gargett was engaged to design a state-of-the-art commercial building located at 45 Flinders St and 10 The Strand in Townsville. “Master planning principles have been integral to the intricate design of this building,” Conrad Gargett director John Flynn said. “Panoramic views are maximised, pedestrian-friendly spaces throughout the activity zones have been encouraged extending the pedestrian network and creating linkages in multiple locations, and indoor-outdoor public spaces cut through the site which open up to a plaza promoting public gathering and shared use. Mr Flynn said the practice was proud to bring its master planning and architecture capability to this prominent placemaking project for Townsville. 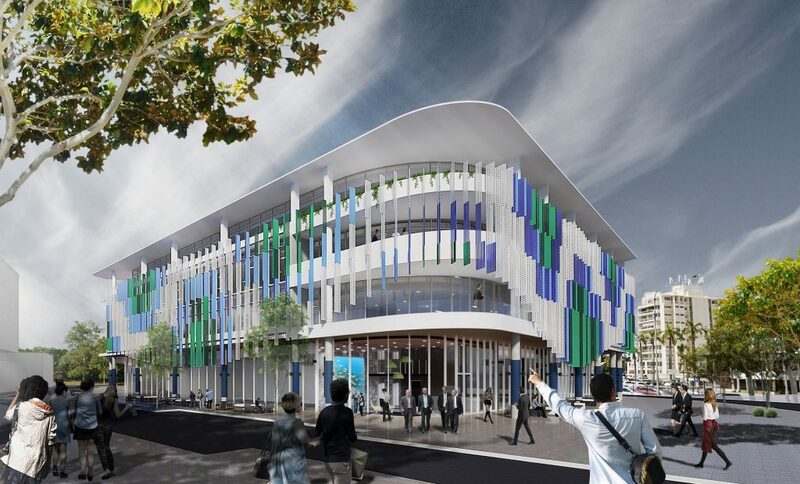 “This significant urban renewal project will improve and invigorate Townsville’s public realm by delivering new active spaces where locals and tourists can engage and enjoy,” he said. Acting Townsville Mayor Les Walker has welcomed the appointment of Conrad Gargett to masterplan and design the project. “It’s exciting to see this major project is progressing further with the help of an architecture firm with a well-established local presence,” Cr Walker said. The Hive could include a high-end hotel, 1000-seat concert hall, tertiary education centre, tropical science research facilities, residential apartments, commercial areas, arts and cultural spaces and a café and dining precinct. The release of the new design comes after the council approved a negotiated decision last month. The changes to the original proposal include the introduction of a precinct plan and allowing a maximum height up to 20 storeys. The condition that requires more than 800 parking spaces remains.